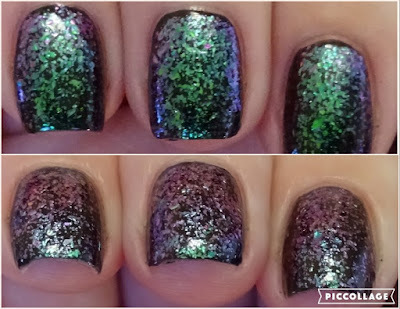 I have the most amazing Chameleon Nail Polishes to show you from Born Pretty Store. They are both duo chromes shifting from green to purple. Both nail polishes have been applied over a black base. Eternal Life is a super sparkly shimmer and Destiny Fairy has larger particles, more like a flakie. Here's Eternal Life under artificial lighting, you can see the duo chrome shift from turquoise to purple - it's really stunning in real life. Followed by Destiny Fairy with its same duo chrome shift but with larger chunkier particles like a flakie. Although the particles are bigger you still get a smooth finish. 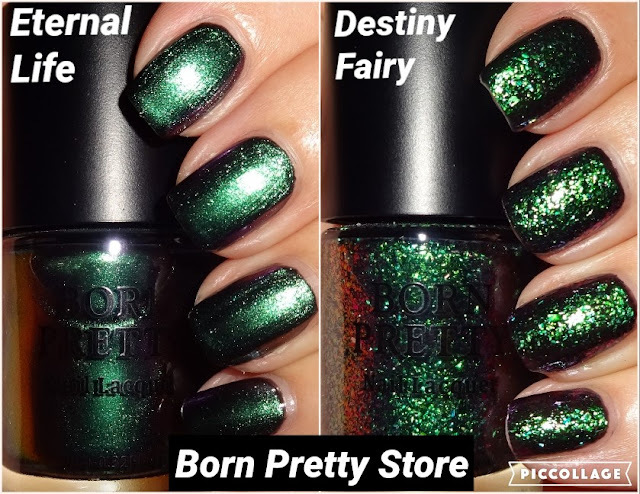 The Born Pretty Store Chameleon Nail Polishes are currently $3.99 / £3.06 / €3.46 each. You can also use my 10% discount code HXBQ10 which gets you 10% off full priced items. Check out the Born Pretty Store website for loads of cool nail art goodies.